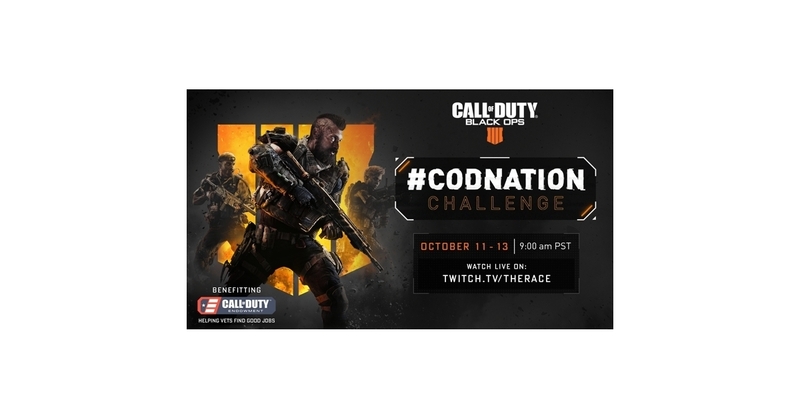 SANTA MONICA, Calif.–(BUSINESS WIRE)–The Call of Duty™ Endowment’s 2018 “#CODNATION Challenge” (previously known as The Race To Prestige), which welcomes gaming personalities Jericho, GoldGlove, Hutch, and VernNotice, for the annual round-the-clock, multi-day streaming fundraiser to help vets, is now live. This year’s event will be bigger and better than ever as the official launch stream of Activision’s Call of Duty®: Black Ops 4, the highly-anticipated new release developed by Treyarch, launching tomorrow. The event is now streaming on Twitch.tv/TheRace live from Treyarch’s studio in Santa Monica, CA, and will continue through Saturday, October 13, at 2 PM PDT. The event is sponsored by GameStop, Lovesac, Scuf Gaming, ASTRO Gaming, and KontrolFreek. Viewers can also follow the stream on Twitter via #CODNATIONChallenge and #TheRace. An updated schedule of the stream can be found on the Call of Duty Endowment’s Twitter account at twitter.com/CODE4Vets. Throughout the #CODNATION Challenge, special guests, including developers, influencers, and pro gamers will join the hosts as they play new modes, explore tips and tricks, and share behind-the-scenes exclusives—all for a great cause. The premier partner of the 2018 #CODNATION Challenge is GameStop, the world’s largest video game retailer. Lovesac, an American furniture retailer specializing in high-quality beanbags, ASTRO Gaming, makers of pro video gaming equipment, Scuf Gaming, creators of pro controllers and high-end gaming accessories, and KontrolFreek, developer of innovative gaming accessories, are also supporting the event. ELEAGUE, the premium esports content and live tournament brand from Turner and IMG, will also be supporting the Endowment with the broadcast of their own action-packed exhibition, the Call of Duty: Black Ops 4 x ELEAGUE #CODNATION Challenge for Vets. The #CODNATION Challenge will handoff to ELEAGUE’s exhibition, being held at ELEAGUE Arena in Atlanta, Saturday, Oct. 13, beginning at 5 PM EDT, with live coverage presented on Twitch. The event will feature 12 popular influencers from the Call of Duty community, and fans will be able to contribute to the Endowment directly via the Twitch stream. The #CODNATION Challenge is gaming with a purpose. This year, the streamers have set a minimum goal of raising $100,000 to support the Endowment, a nonprofit that identifies and funds best-in-class veteran organizations helping unemployed veterans get back to work. Since the program’s launch in 2009, the Endowment and its grantees have placed more than 47,000 veterans into high quality jobs, and at an average 2018 cost-per-placement of $505—less than 1/6 the cost per placement of U.S. Department of Labor programs. The streamers have teamed up with stream-for-charity platform Tiltify, which enables audience members to donate as they watch. Every cent received by the Endowment will go directly to funding veteran employment programs. Last year’s stream raised over $125,000 in donations (and $250,000 in total with a match from Activision Blizzard), which has resulted in placing more than the equivalent of a battalion of veterans into high-quality employment. Activision Blizzard has again pledged to match up to $500,000 in donations made during the Challenge. 100% of the proceeds raised for the Endowment go directly toward the cause, as all operational costs of the organization are funded by Activision. Jericho’s content revolves around gaming comedy and skits. He is well known for his high-energy and fun-playing attitude across YouTube and Twitch. GoldGloveTV offers content revolving around let’s-plays and group multiplayer videos. He is well known for his down-to-earth, genuine personality and collaboration videos with other notable content creators. Hutch was one of the first gamers in the YouTube world. He paved the way for many current YouTuber creators, and is now a regular streamer on Twitch. VernNotice has been active in the gaming community since 2009. He’s a full-time variety streamer and has made a name for himself as one of the funniest personalities on Twitch and Twitter. Since its inception in 2003, the Call of Duty® franchise continues to be among the most-highly anticipated game launches. Call of Duty: Black Ops 4 is developed by Treyarch and published by Activision. The game releases tomorrow for PlayStation®4 computer entertainment system, Xbox One, the all-in-one games and entertainment system from Microsoft, and PC. Headquartered in Santa Monica, Calif., Activision is a leading global producer and publisher of interactive entertainment. Activision maintains operations throughout the world and is a division of Activision Blizzard (NASDAQ: ATVI), an S&P 500 company. More information about Activision and its products can be found on the company’s website www.activision.com or by following @Activision. Cautionary Note Regarding Forward-looking Statements: Information in this press release that involves Activision Publishing’s expectations, plans, intentions or strategies regarding the future, including statements about the expected release date of Call of Duty: Black Ops 4, are forward-looking statements that are not facts and involve a number of risks and uncertainties. Factors that could cause Activision Publishing’s actual future results to differ materially from those expressed in the forward-looking statements set forth in this release include unanticipated product delays and other factors identified in the risk factors sections of Activision Blizzard’s most recent annual report on Form 10K and any subsequent quarterly reports on Form 10-Q. The forward-looking statements in this release are based upon information available to Activision Publishing and Activision Blizzard as of the date of this release, and neither Activision Publishing nor Activision Blizzard assumes any obligation to update any such forward-looking statements. Forward-looking statements believed to be true when made may ultimately prove to be incorrect. These statements are not guarantees of the future performance of Activision Publishing or Activision Blizzard and are subject to risks, uncertainties and other factors, some of which are beyond its control and may cause actual results to differ materially from current expectations.